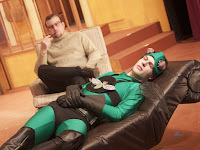 This week the Town and Gown Players bring us the story of four superheroes trying to solve their personal existential crises as they live in a city with no crime to fight. In "Meanwhile, Back at the Superlair," the Human Fly, Leopard Woman, Rhino Man, and Silver Streak have college degrees but no real careers. They have lived together as roommates for years trying to get their lives in order until one day a real emergency arises to challenge their teamwork and nontraditional superpowers. Playwright Greg Kalleres graduated with a BFA from Tisch's Dramatic Writing Program. His plays have been produced in New York, Los Angeles, Austin, Berkeley and Bloomington, IN. He received the "Certificate of Excellence" from the Kennedy Center's Full-length Play Contest and has won “Best Play” twice at Turnip Theatre’s 15 Minute Play Festival in New York City. In addition, Greg has written commercials for ESPN's SportsCenter, Nike, Jordan and New York Magazine. This is a Second Stage production showing for one weekend only, October 17 through 19. Friday and Saturday shows are at 8 p.m., and the Sunday matinee is at 2 p.m. All tickets are $5 on a first-come, first-served basis.